2 Run iTunes and place your companion CD (for Campfire Songbook, Session Tunebook or Bush Dance Digital) in your slot drive. 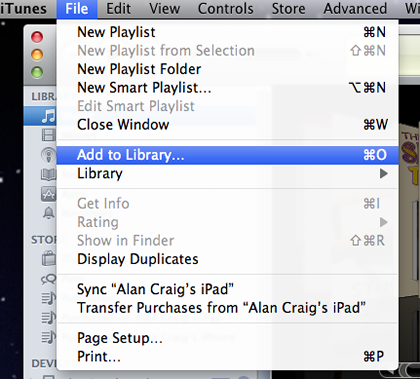 4 When the following dialog box opens, click on the CD icon on the left under “DEVICES”. 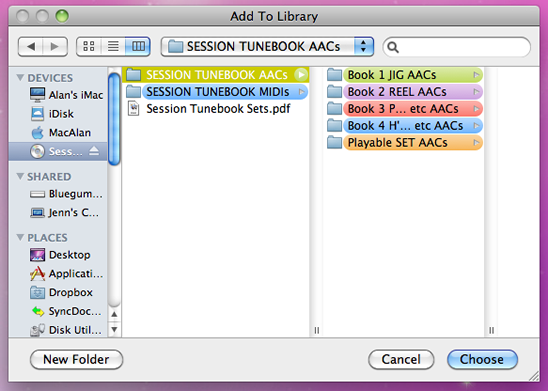 Then select the folder marked “… AACs” and click the blue “Choose” button at the bottom right. 5 All the AAC (MP3) files will now be automatically installed in your iTunes Library with the cover artwork. You can then play them, transfer them to your iPod or MP3 player, make playlists of your favourites and burn audio CDs if you wish. 1 Place your CD in the slot drive. When the icon appears on your desktop, double-click it. 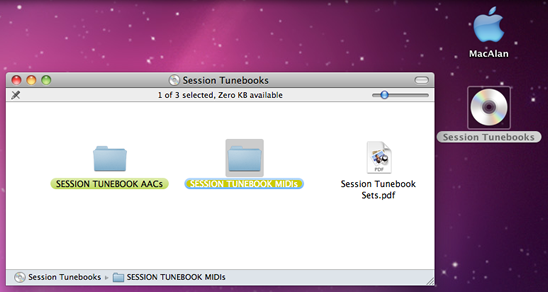 3 Drag the MIDI folder to your desktop. You can now put this folder anywhere on your hard drive (some place that makes sense to you). 4 Double click the MIDI Folder to open its window. Navigate to the tune or song you wish to play. Right-click the track, select “Open With ‣”, then choose your preferred MIDI program. 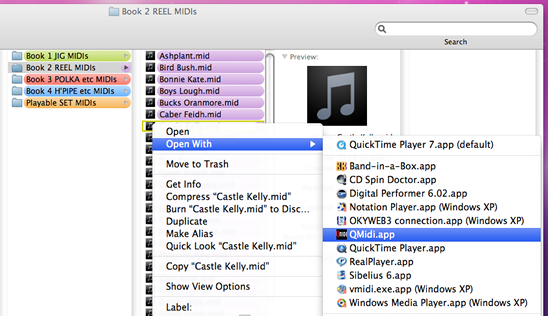 5 QuickTime, RealPlayer or Windows Media Player will all open and play your MIDI files without any problems. If you would like a better-featured multi-track MIDI player, you will be able to find plenty of cheap ones on the Internet. QMidi is a convenient low-cost MIDI/Karaoke Player shareware that can be downloaded from the Mixage Store. Another recommended software device is the Sweet MIDI Player – a trial version can be downloaded from Roni Music. If you already own a Digital Audio Workstation (DAW) like Logic, Pro Tools, Cubase, Digital Performer, or music software like Sibelius or Finale, you already have everything you need.